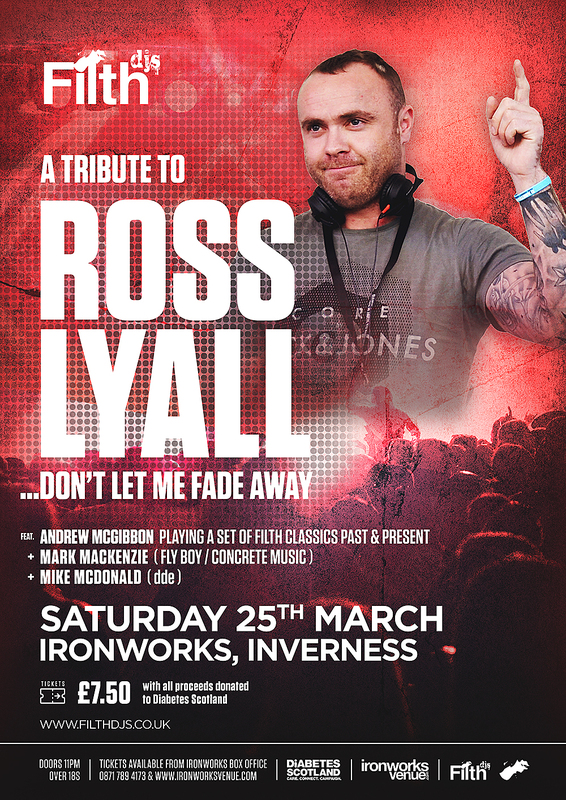 Tickets are now on sale for the Filth: Tribute to Ross Lyall event at the Ironworks, Inverness on the 25th of March 2017. All proceeds from the night will be donated to Diabetes Scotland. The guests, Mike McDonald and Mark Mackenzie, are both Filth veterans and played at a few Filth nights between them. Mike McDonald was a resident DJ with Ross and Andrew at the now closed “Motion” nightclub. He also runs the hugely successful Dundee Dance Event “dde” and invited Filth DJs to play in Dundee many times over the years. Although Andrew was never able to make it to play at dde, Ross made the journey down and absolutely loved it every time he did! 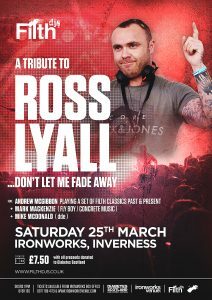 Mike was our first ever guest DJ at a Filth night when we first played at the Ironworks back in 2008. Since Mark first played at Filth for an under 18s night he has come a long, long way. He’s now an established and successful DJ and producer and definitely worthy of the often over-used title of “one to watch”! As well as playing at several Filth nights, Mark was often on the same line-up at Festivals and big nights with Ross and Andrew. Online ticket sales via Ticketmaster will be subject to a booking fee – there will be no booking fee at the Ironworks box office. 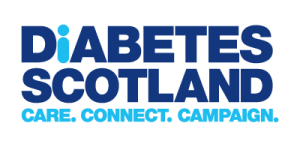 All proceeds from the night will be donated to Diabetes Scotland. Listen to Filth DJs on Monster FM Now!